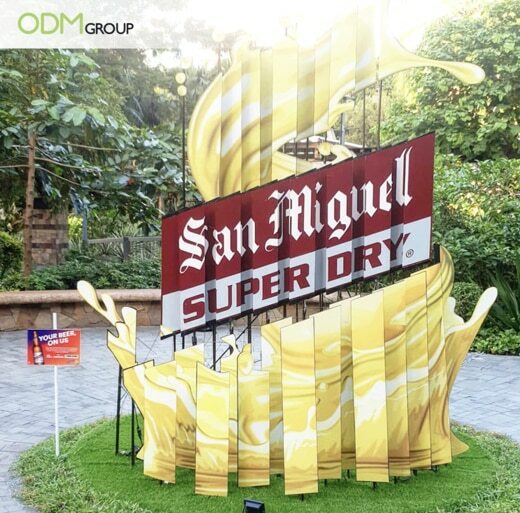 San Miguel Brewery, one of the largest corporations in the Philippines which operates in China and Southeast Asia, is taking their marketing to the next level with a mind blowing art installation. This unique beer marketing idea is a work of art that beer lovers and art enthusiasts love. 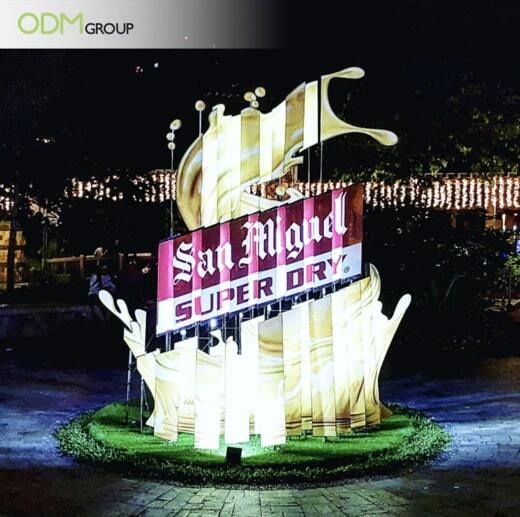 Is San Miguel’s Art Installation A Good Beer Marketing Idea? Our team came across an interesting outdoor display in the Philippines. This massive 15-foot tall metal arrangement wows every passerby which ends up into a quick photoshoot session. This custom beverage display resembles a beer splash that slowly “moves” as the viewer walks around it. It plays with the viewer’s perception and creates multiple images of the installation. What Makes This Art Installation a Good Beer Marketing Idea? Art inspires emotional attachment – What makes this art installation unique is that unlike traditional marketing styles wherein brands highlight their products’ strong points, this art installation just displays the brand name creatively. And art itself elicits a strong emotional response because the artwork stirs different interpretation from different types of people. Hence, customers are more likely to remember this artwork than the usual marketing styles. Stands out from the rest – Art installations are least likely to be on a brand marketer’s top list. This is because it’s hard to execute and they feel that it wouldn’t do much for the brand. But in San Miguel’s case, they’ve created something wonderful and special. The artwork’s peculiarity adds a positive impact on the whole marketing campaign which sets it apart from the rest of the brands. Clearly, the marketing team deserves a pat on the back for this well – executed effort. In conclusion, this proves that brands should also think outside the box and should always be ready to deviate from the conventional methods if the need arises. Yes, it might have been easier for San Miguel to just put up traditional retail POS display, but the brand chose to take risks and come up with this creative idea. Clearly, the brand’s marketing team holds brilliant ideas which prove that they are good at what they do. If this beer marketing idea interests you, please don’t hesitate to contact the ODM team. Our team is always ready to answer all your marketing and manufacturing queries. Spam Takes Their POS display Game to A New Level. It’s simple, yet the overall design has a strong impact on shoppers. Lastly, an interesting inflatable outdoor display to take your beer marketingup and center.